The main event for Saturday night in Las Vegas fell apart in the early hours of this morning, but Cormier is still set to compete. UFC light-heavyweight champion Daniel Cormier and UFC president Dana White at last night's UFC 200 press conference. HE WON’T HAVE the chance to gain revenge against Jon Jones this weekend, but Daniel Cormier may still fight at UFC 200 in Las Vegas. Cormier was due to defend his UFC light-heavyweight title against Jones — who defeated him in January 2015 — at the T-Mobile Arena on Saturday night. However, the bout was removed from bill in the early hours of this morning after it emerged that Jones has been flagged for a potential anti-doping violation by USADA (United States Anti-Doping Agency). 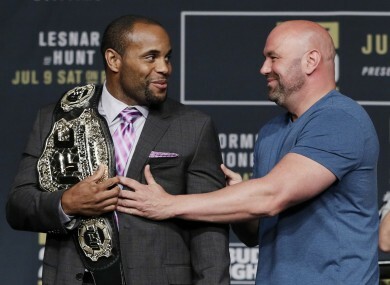 Despite the fact that the weigh-ins for UFC 200 are just over 24 hours away, UFC president Dana White has said this evening that Cormier will be fighting on Saturday. Plenty of fighters have thrown their names into the hat, with Gegard Mousasi and Alexander Gustafsson likely to be among the front-runners. UFC middleweight champion Michael Bisping — who defeated Luke Rockhold on two weeks’ notice last month — has also expressed an interest, but White dismissed that possibility. Email “Dana White confirms Cormier will fight at UFC 200 despite Jones' withdrawal”. Feedback on “Dana White confirms Cormier will fight at UFC 200 despite Jones' withdrawal”.